Actors learn how to persuade. Crafted actors spend years mastering a craft that is designed to build audience belief. It is no surprise that companies pay more advertising dollars each year to actors than to professional sales people: companies understand the importance of acting techniques and performance skills in the selling of any idea or service. When preparing for roles on stage or on camera, actors look for acting objectives: compelling communication actions that lie underneath the words they speak. Focusing on the objectives and keeping these objectives private strengthens the speaker’s intention and level of vocal and physical commitment. As you prepare for a business talk, no matter how formal or informal, divide your ideas (or notes) into individual topics that are smaller than the entirety of your message. Identify specific acting objectives: behaviors that you wish to adopt that are directed toward the listener, active, and specific. As you speak, focus on these underlying objectives (not on your words), and pursue these objectives energetically. This will dramatically enhance your persuasive power. To capture audience attention and keep it, actors “take stage” — using space as if they own it. Business speakers, seated or standing, should do the same (whether they are speaking informally or delivering a formal presentation). When speaking for business, situate yourself in the position of power, usually front and center. Plant both feet firmly on the ground, and imagine that your legs are tree trunks and that your feet are tree roots extending deep into the ground. Whenever possible, give handouts after a talk is completed, not before or during your talk. After your final remarks, thank your listeners and pause for a count of five: maintain eye contact and receive/experience the response (applause, during a formal presentation) with a broad smile. 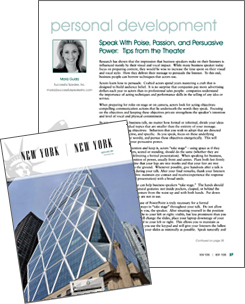 Gestures and body language can help business speakers “take stage”. The hands should be open and available for natural gestures: not inside pockets, clasped, or behind the back. Whenever possible, gesture from the waist up and with both hands. Put down pens and pointers when they are not in use. If you have decided that the use of PowerPoint is truly necessary for a formal presentation, be sure to plan ways to “take stage” throughout your talk. Do not allow PowerPoint to steal focus from you, the speaker. After situating yourself in the position of power, allow the screen to be to your left or right: visible, but less prominent than you are. If you are the one who will change the slides, place your laptop downstage of your body (toward the audience) and to your left or right. This allows you to maintain as much eye contact as possible as you use the keypad and will give your listeners the fullest view of you. Draw attention to your slides as minimally as possible. Speak naturally and conversationally, and be sure that the text on your slides is only the briefest paraphrase of what you will actually say. Actors use the art of improvisation to become deeply connected to the situation of a scene and to produce vocal energy and body language that are convincing. At the heart of drama, we find conflict. Actors, characters in plays, and business people in real life are always trying to resolve conflict and get what they want. The harder we pursue what we want, the more commitment and passion are expressed through the voice and gestures. Business speakers should practice improvising scenes of high conflict with friends and trusted colleagues. Before you begin, set a timer for seven minutes, and end your improvisation only when the timer rings. Set two rules for this exercise: (1) you must use language to get what you want, and (2) you may not touch your partner. Use as many verbal strategies as you can, in order to get what you want. Put as much commitment and passion in your voice and gestures as possible. Tape recording your improvisations and listening back can help you evaluate your vocal energy, as you would assess the actors’ work in a radio drama. Every business situation, no matter how formal, should be viewed as a conversation, and you can use volume, pacing, and pitch to speak more effectively. Project so that people furthest away from you can hear easily, and always maintain a conversational tone. To emphasize key points, pause and then slow down. Vary your pitch, and become aware of the pitch glide at the end of your statements. An upward glide communicates a yes/no question. Ending a statement with a pitch glide upward, therefore, projects a questioning intention and a lack of confidence. To command authority, be sure to end your statements with a pitch glide downward. You can increase your speaking power by reducing your use of fillers (“um”, “uh”, “you know”, etc.) Set a timer for three minutes and tape yourself as you speak in extended sentences on any topic of your choice. As you speak, imagine that your words create a long string of pearls that are connected with no breaks. When you feel the urge to use a filler, stop yourself, pause, and then say the filler silently to yourself. Play back the tape and monitor your speech for fillers. If you practice this exercise each week, you will begin to use fillers less and less frequently. Business speakers who use these techniques project confidence and professionalism and enhance their power to persuade the business listener.